The exhibition furniture used to display information about products and services at trade shows and exhibitions plays a significant role in shaping public opinion about organisations and their merchandise. Scribo Displays provide promotion counters that can be used in combination with printed displays of different hues and colours. These promotion counters can be assembled and dismantled with consumnate ease and come with carry bags for convenient storage. Needless to say, the durable and portable promotion counters can be used and reused at different trade shows for exhibiting products and services. 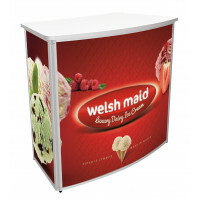 Go through our catalogue of promotion counters as you just might locate the most suitable promotional counters for your trade shows.